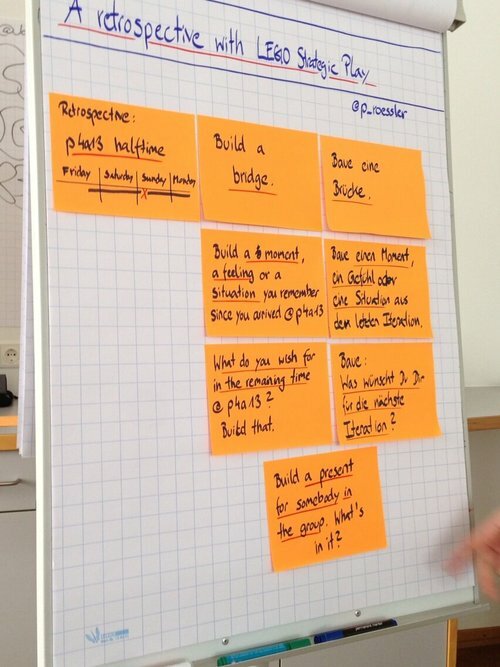 For the third time in a row I had the pleasure to participate at Play 4 Agile (Un-)Conference at Rückersbach. Three years ago Play 4 Agile 2012 was my first experience with Open Space technology and even my first encounter with the Agile “Play” Community. (Thanks to Sebs for introducing me back then!) In review this year’s Play 4 Agile was intense and enlightening as ever. The Pre-Event was mainly based on Kevin Werbach’s Gamification Design Process. Some results after only 3,5h were amazing and could actually work for real. My 2 favorites were Carpe Diem (Objective: “Experience more life to prolong your life.”) and a prototype on how to make house-cleaning more fun (Objective: “We want a clean and organized house.”). But I think all groups turned out with a valuable result. After 5 minutes I knew that the changes I introduced were not going to work. So the participants (and me) struggled hard and I stopped the actual game. But then started a (for me) fruitful discussion on how the game could work or could have worked. Thanks for every participant for their input. It was great to find my new colleague Tom among the #p4a14 participants. At our company we are struggling with prioritization on what to do next (or rather first, as the backlog is overfilled…). To have a common understanding in the company on how hard it is to decide and to reach at least some kind of agreement among managers, Tom introduced “Buy me a feature” to prioritize what should be done next about 9 months ago. We thought it was a good idea to get feedback on this approach. So Tom held a session on how and why we are using “Buy me a Feature” and how the process evolved over time. The participants were curious and gave some very valuable feedback and suggestions on how to improve. Loved it. This year I felt that there were quite a number of spiritual and coaching sessions proposed, and less “play” sessions. I’d loved to have more focus again on “play” next year, but I know it always depends on the people and their interest and energy. Play 4 Agile 2015 will take place on February 20-23, 2015. Can’t wait. 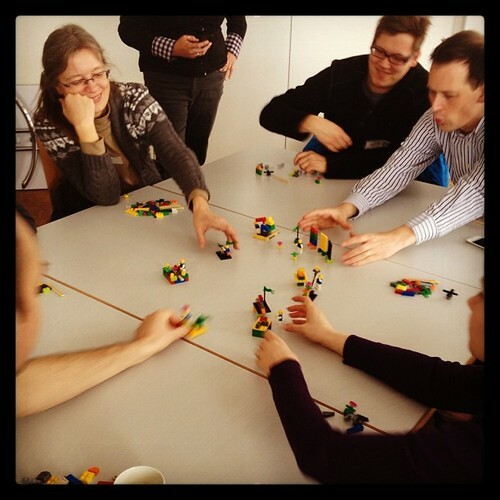 Lucky I am, because I attended “StrategicPlay FUNdamentals on LEGO® SERIOUS PLAY™” about 2 years ago. (Read my post on it here.) My company was unbelievable and invested in the “Identity and Landscape Kit” afterwards and I had the chance to do a number of LEGO Serious Play (LSP) Workshops since (HR team, UX team, different Project teams and others). I especially use the “Exploration Bags” for team building and also for retrospectives. So I decided to do a session with those and get feedback on the LEGO retrospective I tried with teams already. Build a feeling or mood that you experienced in the last iteration. Build your wish for the next iteration. The session at “Play 4 Agile” was on Sunday morning, so we actually did a retrospective on the UnConference. What normally happens is that after the third round (“Your wish for the next iteration.”) you have so many stories, themes or topics on the table. You can then simply start a discussion and create an action plan. I got really good feedback on the session. Thanks! 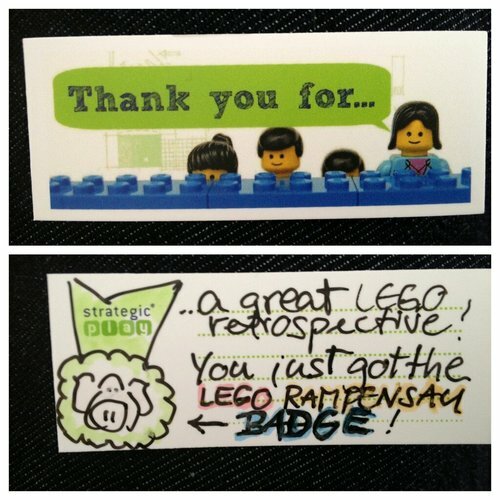 And I even got the “LEGO Rampensau Badge”. Yes! Some weeks ago I attended the “StrategicPlay® Fundamentals Facilitator Training” at the StrategicPlay® headquarters and have used elements of LEGO Serious Play™ (LSP) quite some time with teams since then. As a Playmobil® fan it is “shocking” to see how easy you can use LSP for solving complex problems or helping team members to understand each other better. 😉 And additionally it is fun. Constructionism, Play, Imagination and Identity. You can dig into the science of LSP by reading this wonderful PDF. By iterating this sequence you are becoming more and more confident about your modeling and story-telling skills. As all participants are building a model about the same subject, you are at the same time sharing knowledge, ideas or problems with the others. After starting with straight-forward subjects (like “Build a tower as high as possible.”) it feels easy to deal with methaphorical subjects (like “Build your perfect team process.”) after some iterations. I have just started to use LSP with teams, but am convinced, that an experienced StrategicPlay® facillitator can help any team to reveal the true essence of a problem and then find sustainable solutions. By now I have used LSP in a couple of 2 hour team sessions mainly to discuss their process and their roles within the team. This is only the start. LSP seems to allow infinite options for working with (agile) teams. I am very lucky to have our management sponsoring the LSP Landscape and Identity Set (not available at the moment…), which you definitely need for larger workshops (“We are building our company vision.”). I’m planning to have a Sprint Retrospective with LSP before Christmas and will let you know about my experiences.